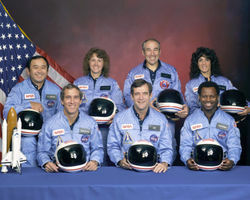 On January 28th, 1986, Space Shuttle Challenger was launched at 11:38am on the 6-day STS-51-L mission. During the first 3 seconds of liftoff the o-rings (o-shaped loops used to connect two cylinders) in the shuttle's right-hand solid rocket booster (SRB) failed. As a result hot gases with temperatures above 5,000 °F leaked out of the booster, vaporized the o-rings, and damaged the SRB's joints. The shuttle started its ascent, but seventy two seconds later the compromised SRB pulled away from the Challenger, leading to sudden lateral acceleration. 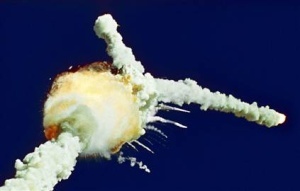 Pilot Michael J. Smith uttered "Uh oh" just before the shuttle broke up. Torn apart by excessive force, it disintegrated rapidly. Within seconds the severed but nearly intact crew cabin began to free fall and seven astronauts plunged to their deaths. I was a child then and remember watching in horror as Brazilian TV showed the footage. At the time I didn't know that SRB engineers had previously warned about problems in the o-rings, but had been dismissed by NASA management. I also didn't know who Richard Feynman or Ronald Reagan were. It turns out that President Reagan created the Rogers Commission to investigate the disaster. 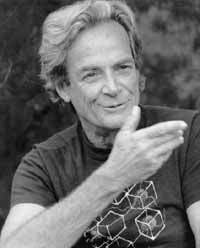 Physicist Feynman was invited as a member, but his independent intellect and direct methods were at odds with the commission's formal approach. Chairman Rogers, a politician, remarked that Feynman was "becoming a real pain." In the end the commission produced a report, but Feynman's rebellious opinions were kept out of it. When he threatened to take his name out of the report altogether, they agreed to include his thoughts as Appendix F - Personal Observations on Reliability of Shuttle. The Space Shuttle Main Engine is a very remarkable machine. It has a greater ratio of thrust to weight than any previous engine. It is built at the edge of, or outside of, previous engineering experience. Therefore, as expected, many different kinds of flaws and difficulties have turned up. Because, unfortunately, it was built in the top-down manner, they are difficult to find and fix. The design aim of a lifetime of 55 missions equivalent firings (27,000 seconds of operation, either in a mission of 500 seconds, or on a test stand) has not been obtained. The engine now requires very frequent maintenance and replacement of important parts, such as turbopumps, bearings, sheet metal housings, etc. Many of these solved problems are the early difficulties of a new design. Naturally, one can never be sure that all the bugs are out, and, for some, the fix may not have addressed the true cause. The software is checked very carefully in a bottom-up fashion. First, each new line of code is checked, then sections of code or modules with special functions are verified. The scope is increased step by step until the new changes are incorporated into a complete system and checked. This complete output is considered the final product, newly released. But completely independently there is an independent verification group, that takes an adversary attitude to the software development group, and tests and verifies the software as if it were a customer of the delivered product. To summarize then, the computer software checking system and attitude is of the highest quality. There appears to be no process of gradually fooling oneself while degrading standards so characteristic of the Solid Rocket Booster or Space Shuttle Main Engine safety systems. To be sure, there have been recent suggestions by management to curtail such elaborate and expensive tests as being unnecessary at this late date in Shuttle history. There are other interesting themes in there, and Feynman's insight can't be captured in a few bullet points, much less by me. What do you get out of it?